What do you imagine when we talk about the ‘next generation of notebooks’? The ones you saw in the Jetsons where you saw notes written down on a blank piece of technology and the script turning into text. The app in question well is a replica of exactly that in a much better format. Enter My Script Notes – a funky little wonder of smartphone technology that will help your organize and track all the essential info and plans you make. It also succeeds in doing so in the most organic fashion possible by letting you extend your natural handwriting onto your Android device screens by using the S-pen or your bare hands. The My Script Notes app is efficiently designed and offers you a plethora of options to customize your notebook exactly how you want it to match your lifestyle needs. Here this means that you have multiple options for the design of the pages in picture and in addition to that you also have different versions that you could save the text in. You can also pre-select the number of pages that you would like to have in your book. 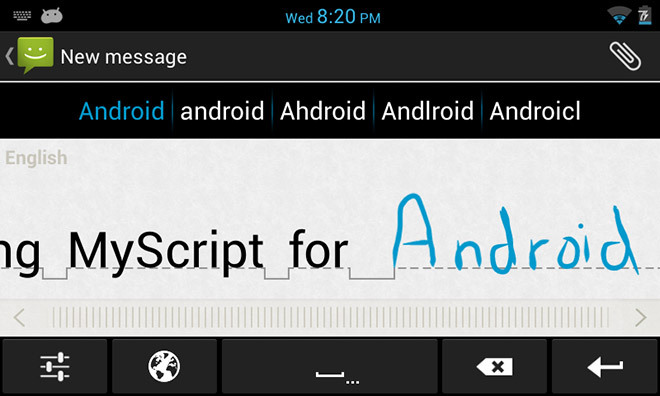 Once you enter into the pages you have option at the top that allow you to Write using text in the S-Pen and handwriting. You can also draw on the page, and an eraser and a conversation bubble that will give you different kinds of conversation and thought bubbles to add in to the app. Now the best part is that the SDK technology within the app will convert anything and everything that you have written and present it to you in a digitalized format that will make it look like print and that too on the desired page that you wanted it to look like. Using this on the tablet more evidently is fun and the interface comes out in a better way too. You have all the pages to the left and highlighting the page that you are on is possible too. 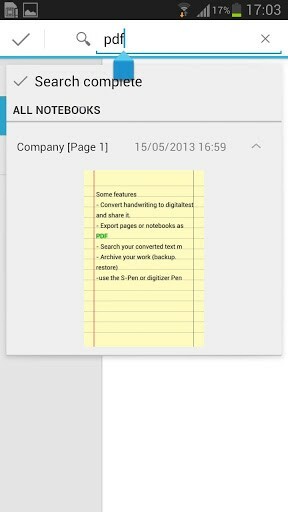 You can search and back-track your notes too, using the search bar. All you have to do is type in what you are looking for and the search results will appear down. 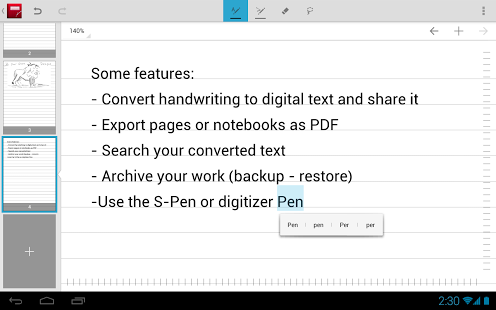 Once you are done creating a mammoth volume of your notes, you can also export the entire set of documents as pdf files, which means that you can keep writing using your S-Pen and take down notes. This can then be converted into a book which perhaps can later on even be printed. Add in the file name while exporting and hit the button and what you have for you is your very own book. You can go ahead and add images to the pages and your book too. Don’t forget to choose your style of pages too, frim the classic single line notebook from school, the double line red and blue book from kindergarten, the typical college notebook and the classic sticky note style book. You can pick a suitable color and choose whether you want a margin or not. You can also change the color of the pen that you are writing with and a single page can have multiple colors on it too. Overall, the My Script Notes app is a joy to use and has a ridiculously smooth interface that gives a futuristic and highly professional touch to your digital note management. Math; it was the very word that sent down shivers down your spine in school and college, especially on the eve of a major examination. Now that you look at it, you do seem to be relieved that you don’t have to deal with it on such competitive levels on a daily basis. However, if you had been fortunate enough to lay your hands on the My Script Calculator app, you would surely have no qualms about facing it head on without hoping to copy your friend’s answer sheet. The app has a neat and user-friendly interface that is rendered via a blank screen in white. It consists of sensors within it that will translate the handwriting of humans into digital text. This includes all possible kinds of handwriting including that written in through the s-pen, and bare hands. In fact the app is designed especially for that and there is no need even for a keyboard. The My Script Calculator app solves math problems so on typing down the simple problem 10 + 10, you will see the amateur handwriting morph into a neatly displayed digitalized test that will then look like a coherent problem. After that and ‘=’ sign will appear and the answer as ‘20’ will make an appearance slowly by fading its way in as if it were magic. Further to that, the My Script Calculator Android app doesn’t work merely for addition-subtraction problems. It has the ‘BODMAS’ rule synced into it and on typing longer problems like 3 + 5 x 10 – 8 x 5 + 10 The app will pull out the answer and present it to you on your screen no matter how many syllables and parameters. So you see how a student’s life is made easy using the above features where all you gave to do is type in the problem and you have the answer make its presence right in front of your screen. 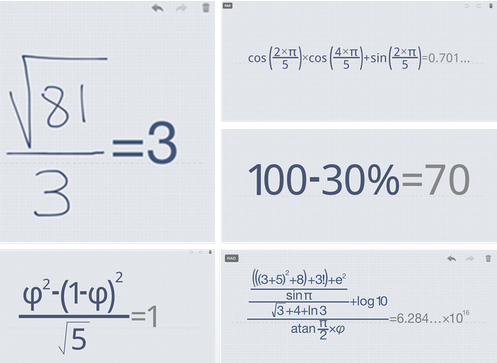 The My Script Calculator app has an in-built technology which enables it to solve all these problems kind of like scientific calculator only the difference here is that you have to write down the sum or the problem as against typing numbers and signatures down. Sounds simple ha? Now you must be wondering where the catch in such an amazingly life-easy making app would be? Well there aren’t any. And for those of you’ll who thought this would come at a price, the apps or free. You also have a portrait and a landscape option and can also redo and undo operations. Further, you can cancel out problems like you would strike out cancellation in the app too. Not surprisingly, the My Script Calculator app has been rated 5 stars by over 31,000 people, and is batting strong with an average of 4.6 stars on the whole. So what are you waiting for? Upgrade your mathematical calculation efficiency and become the go-to number problem solver among your friends without being a savant by downloading this cool Android app for free from the Google Play Store.